Having stinky feet can be cause by a wide variety of reasons. Many are health related and can be treated after being diagnosed properly. Others are due to mistakes you are making when choosing and wearing your socks and shoes, and in some cases it is simply a matter of hygiene. Of course, there are cases when certain hormonal changes and other genetic and health predispositions can cause a bad odor of the feet. Here are some of the most common reasons for bad smelling feet, and ways to handle the problem. If you are wearing inappropriate shoes which are not breathable, do not have moisture wicking insoles, or are wearing the wrong kind of socks with your shoes, then it is only natural that your feet will sweat more profusely. Sweat is only natural, but when it gets out of control it can cause the growth of bacteria growing on your skin and in your shoes. Bacteria love the warmth produced by your sweaty feet, and feeds on the dead skin cells which we all shed on a daily basis. The best way to deal with sweaty feet is to make sure you wash your feet regularly and meticulously. Use pumice stone or other methods to exfoliate the skin of your heels, so that you get as much of those dead skin cells off. Also, do change your socks regularly. You may have worn them for just a few hours, but remember – the dead skin cells are already there, so throw them in your laundry basket and go ahead and put on a fresh pair before putting on your shoes. It is recommended that you choose socks made of merino wool or other moisture wicking fabrics, especially if your feet tend to sweat a lot. Remember to take off and change your heavy socks in the winter once you come home too. Yes, it is cold, but your feet will continue to sweat, especially given the fact that most of us choose to wear less breathable and insulated boots and shoes in the winter. You can also help reduce the sweating of your feet by applying anti perspirant on them after you wash them. Also, try talcum or baby powder which can help absorb the moisture and limit the excessive sweating. Most importantly, make sure you wear shoes which are breathable when possible, and which have moisture wicking insoles. There are some inserts which are treated with anti-microbial chemicals and which help wick away the moisture which you could try wearing in your winter or other boots too. The bacteria can start growing in damp and warm shoes as well. It is a common problem with people who wear their boots all day long such as oilfield workers. It is advisable to have extra shoes and boots for work, exercise or everyday activities, so that you can interchange between pairs while one of them airs out and dries completely. 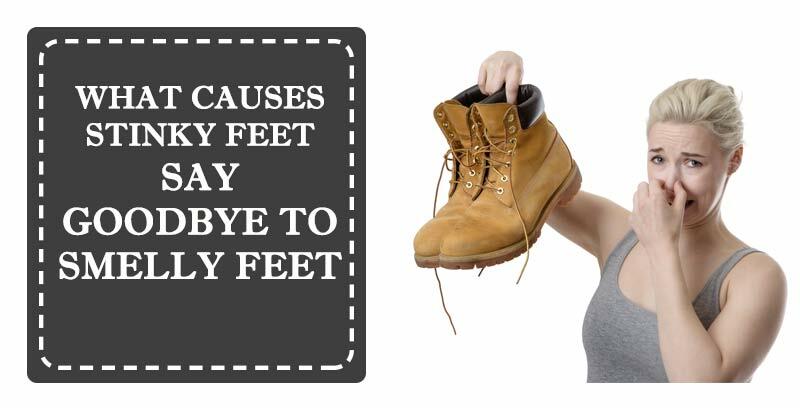 Make sure you remove the insoles from your work boots or other shoes when you return home and let them and the shoes dry off completely before putting them back on again. You can sprinkle the inside of your shoes with baking soda or baby powder in the evening and let them sit until the morning. The powder or soda will help absorb the moisture and remove the bad odor. Also, shoes need to be cleaned and washed regularly from the outside and inside. Always follow the instructions of the manufacturer when you proceed to wash your shoes, and never be tempted to put them back on before they have dried completely. Stress and anxiety can cause excessive sweating of different parts of the body – feet included. If you are overly stressed, your feet are more likely to sweat and start emitting bad smells. The stress induced perspiration is different than the normal one induced by heat, since it is emitted by different types of sweat glands. It smells worse than the normal sweat too. So, make sure you take the necessary measures to relieve your stress and anxiety by talking to a doctor or other expert, by taking time to relax, meditate, exercise and perform other stress-reducing techniques. Also, if your work is too stressful, you should consider taking a few fresh pairs of socks to work with you, so that you can change your socks if you feel that they are getting wet. Noticed how bad the feet and shoes of your teenage boys smell? Well, it is not just a matter of personal hygiene. The main reason for the increased sweating and smell is hormone induced and the increased production of testosterone in teenage boys. Pregnant women or women in menopause may also notice more profuse sweating in their feet. This too is due to the hormonal changes and imbalances which occur at these times of a woman’s life. Hormonal imbalance due to health reasons can also lead to sweaty and stinky feet. Getting the hormones back to normal does reduce and eliminate this problem as well. Athlete’s foot is one of the most common reasons for bad smelling gym orrunning shoes. The fungus which develops and grows on the feet can cause the foul odors. Thankfully, this condition is usually easy to treat with anti-fungal cream for the heels and anti-fungal powder for the top of the foot and in between the toes. Fungal infections are easily spread in locker rooms and around pools where people step with their bare feet. Sometimes, if the problem is more persistent, you may need to consult with your doctor, who will determine what type of fungal growth you are suffering from and prescribe you the most appropriate medication and treatment. In some cases oral antibiotics may be needed to kill of the fungus and remove the smell. This is a very common reason for bad smelling feet and shoes. In fact 10-15% of the people complaining from bad foot odor have been found to have bacteria growing and living in their shoes. The bacteria such as micrococcus sedentarrius feed off of the dead skin cells from our feet, and love damp environments. The bacteria produce sulfur and acid compounds which cause the nasty rotten-egg like smell. Again, better personal hygiene, changing socks, washing the shoes and always letting them dry off and air out before putting them back on again can resolve this stinky problem. This is a more serious health condition, which can be due to a number of factors, including: genes, anxiety, diabetes, pituitary and adrenal gland problems, gout, tumors, menopause and others. It is a condition where a person sweats profusely and excessively in certain parts of the body or the entire body. This condition is known to cause serious problems for the people suffering from it, mainly due to the embarrassment associated with the sweating. In certain cases, people may avoid all kinds of social contacts and choose to become isolated due to this problem. I you have excessive sweating, go to your doctor who will look for the underlying reasons for your hyperhidrosis and will prescribe you with the proper treatment to manage the condition or cure it.